We were thrilled to have Jon and Meesh from Junktime Puppets construct the bike cart puppet ‘Big Blue Poppa’ here. They used mostly found materials and built him to be part of their puppet show for the Kispiox Valley Music Festival. Looking forward to what they come up with next!! Invite to TCUP’s 2018 Volunteer Camp! 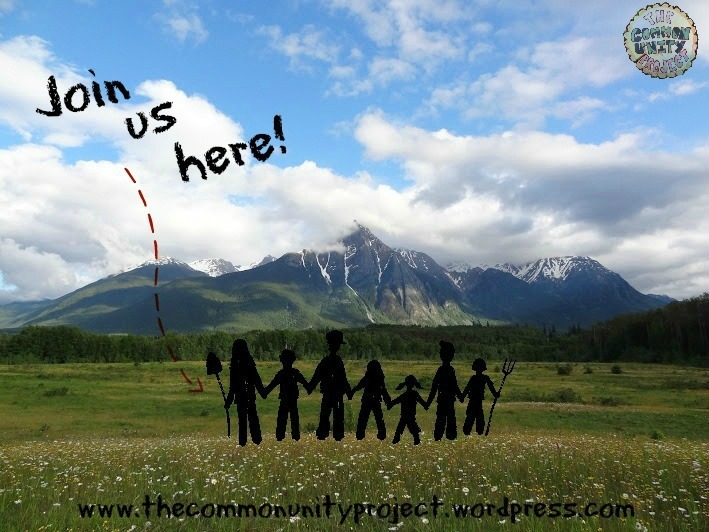 Join us for a six week experience at The Common Unity Project. We are an intentional community living off-grid, inspired by permaculture, and in the midst of building a hybrid earthship communal home. This summer we are focused on finishing the building we started three years ago so we can have an indoor kitchen and living space. This includes working with cob and plaster, laying flooring, framing and installing windows and doors, and insulating with straw bale. In exchange for volunteering on the building 5 hours a day, 5 days a week, we will be offering several workshops, as well as food and a place to camp. The workshops include an introduction to: Our Community; Permaculture; Herbal Medicine; Mindfulness and Heart to Heart communication; & Natural Building including Cob and Plaster. Priority will be given to those who can come for the duration of the camp. If you are interested please read the volunteer page on our website and apply by filling out the questionnaire and emailing us @ the commonunityproject@gmail.com. Recently 13 members and prospective members of The Common Unity Project attended a weekend workshop titled “Heart to Heart Communication” created by an extraordinarily wise and highly intuitive community building workshop facilitator RoseMarie Pierce. RoseMarie’s innate ability to gently guide people inward to the route of their problems is confounding. She has over 25 years of experience sharing these workshops which use the framework based on the principles identified by Dr. M. Scott Peck in his books: A Different Drum and The Road Less traveled. Members at TCUP originally sought out to find a solution to what we felt was a lack of communication process. We value living in community as a way to enrich our individual experience. We want to learn how to live authentically with one another; to build deeper, interdependent relationships; to heal past wounds and break free of our own egoic patterns. Yet without a communication process and a common understanding of conscious communication we found that we were struggling to implement these ideals and bring them into our everyday being. The weekend workshop turned out to be a profound experience for everyone. The basic premise of Heart to Heart communication is that everyone has their own unique perspective in how we see the world, and how we see the world is a direct reflection of how we see ourselves within it. Our external likes, dislikes, judgements, blame etc, are all projections of our own individual experience. When we start to understand this we can learn to speak truthfully, taking responsibility for our feelings rather than trying to change or blame others. The workshop agenda was with no direction or goal. We were simply asked to “speak our truth at all personal cost.” We the participants took the wheel, it was a spontaneous journey that took us in all directions and gave everyone an opportunity to share their deepest selves. Past traumas, childhood secrets and withheld truths came up and new levels of understanding and connection were reached. The workshop ended like it began… in complete silence. I felt a comfortable calmness in my body. Like I had let out everything that was keeping me distant from others and revealed my true self, I had nothing left to hide. I looked around the room and I saw everyone with new eyes, I felt no judgment being given or being received. I felt unconditional love and complete trust for everyone at that moment. After the course we have had much time to reflect, there seems to be a general sense of empowerment from this new way of interaction. More and more we are taking responsibility for our perception of a situation, and our language we now use is starting more and more to represent that. We have continued weekly Heart to Heart circles without a facilitator and more layers are being revealed. There is still struggle, pain, emotions and there always will be. We now have the tools to express and work through these feelings and because we are sharing them with each other, everyone benefits. Another greenhouse project that is close to home for us, the earthship in Sik-e-Dakh (Glen Vowell) is finally done. The project has gone from a deconstruction zone of the old hall, to a one month long dusty tire pounding party, to a more traditional construction workplace with roofing and painting, to cob and plaster fest. The greenhouse is now complete with grow beds planted with tomatoes and peppers. Much thanks to Caylin Holland for all his hard work on the project, as well as all the volunteers from Sik-e-Dakh and elsewhere who helped out. It is certainly a beautiful greenhouse built for generations to come. Look out! Some asteroids struck Two Mile, BC. Specifically, our field. And not so much asteroids as an excavator. We have taken some leaps this year towards our goal of a permaculture food forest and perennial plant nursery, thanks to a generous donation from The Cassandra Trust. What we are designing and building here on our property, we hope to be able to teach, inspire, and supply the means to do elsewhere. Since we live without ties to the grid or water lines, and we chose to build our home in a sandy field relatively far from the river, ponds was our chosen method of water catchment and storage. We have one pond that was dug in 2015 and has been supplying our water needs since, supplemented by the tank that catches rain from the roof of the earthship. Last year we upgraded with a solar powered pump that pumps water from the pond to a tank on the hill supplying gravity fed water for the garden. Now this year we dug a pond next to the tank, to supply water for the hugelbeds we planted in the fall. The hugelkultur is on contour around the hill and will be flood irrigated via a swale above it. So far even without the swale, the trees and shrubs we’ve planted below the hugelkultur seem to be doing well (those that survived the winter anyway), as well as the annual crops we planted on top. The pond, being on top of a hill, won’t hold water right away, but the excavator operator, Taylor, smeared the sub-soil with a heavier clay content up on the sides to facilitate sealing. The next step for us is to get pigs and have them live in the pond until fall. Pigs are great pond sealers, they stomp and compact the ground, and love to wallow in the muck. The idea is to keep running water into the bottom of the pond, which alone helps bring the finer clay particles to the surface, and start a small pond that will expand as the pigs seal it. So far we have the electric fence charger and poles in the ground, now we just need a pig shelter and some pigs. Next came a lower pond, or crater garden, between the chickens and the bees. This was a naturally low lying area that held water in the early spring. Water slowly trickled in as it was being dug, and now it is about half-full. The peninsula in the middle was our compromise for a duck island, since we would like to have ducks live there in the future. We will watch and observe it over the year as we build up the soil around it for future gardens. And last but not least, a shallow well. We stuck a ten foot culvert, drilled with holes in the bottom 6 feet, in a hole by the pond and piled gravel around it. It was a battle to get the pipe in and the gravel around before the silt caved in, but we did a fair job and so far its holding water three feet from the top. We will pump it out until the water runs clear, and hopefully it will be a source of future drinking water and winter irrigation. And of course, the garlic is coming up and doing well, despite being in a spot that is possibly too wet. An odd problem for us, this spring we had flooding in the fields by the pond. It was too wet to plant potatoes for weeks and we had to dig some ditches to drain the water away. Participants will be encouraged to design and implement their own project with the support of the community. The internship will be offered free of charge along with basic food and accommodation. In addition, we will offer participants a small stipend of $50/month.